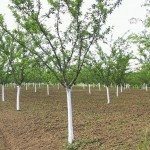 What is the minimum size for a plum tree? We received a pair of very small plum tree plant. The branches are under one finger diameter. It is almost winter. Is it best to keep the plants indoors as container plants this winter until they get bigger? I would hold the plants in pots until spring in your growing zone. It would have been best to plant around Labor day and water through until ground freeze. Continue to water and let them naturally go dormant. You can keep them in a sheltered location, it appears you have a greenhouse or a garage works well. I would add some protection around the pots, but make sure they do not freeze and thaw throughout the winter, keep the temps consistent. I like to check the pots once a month through the winter to make sure the soil has not completely dried out. You can add a small amount of moisture.